Published in the South Kent Gazette, 9 May 1979. From Fisher Gate the town wall followed roughly the line of Townwall Street up to Woollcomber Street. On the route was St. Helen’s Gate (14), otherwise called Cross Gate, from St. Helen’s Cross, which was over it. That stood near the back of the “Fox Inn.“ The wall, then turning a little landward to clear the Eastern Harbour, continued to a point near Arthur's Place, which extended from the end of St. James’ Street to Clarence Street, the linking road, before war-damaged properties were cleared, between Townwall Street and Woolcomber Street, 73 yards from the principal door of Old St. James’ Church, and there stood East Brook Gate (15), the main approach to Dover’s early Harbour. From there, without any further gates or towers, the wall crossed the present sites of Woolcomber Street, Trevanion Street, and Old St. Jame’s Churchyard, joining the Castile Cliff. ABOVE: A print of the old Guildhall in Market Place, dated 1788. A century after the Roman invasion the haven became shallower, and when the sea forsook the area, the builder took possession. He was Withred, King of Kent, who, having a houseful of Canons up in the Castle, occupying space needed for men-at-arms, selected this new made land as a site suitable for a great church and monastery. This establishment was built between the years 691 and 726. When the church had been built on the western side of the square, the monastic buildings margined the river towards the sea, there was none of the area left unoccupied — the time of its use as a Market Place being then in the far future. Three hundred and forty years passed, and then the Norman Conqueror, having marched victoriously up from his landing place at Hastings, set fire to Dover, and in that conflagration much of the church and the monastery perished. Being a religious people, the Normans rebuilt the church after their own style, and restored the habitations of the Canons, but the Norman Archbishops were not long content to allow these Saxon Canons to remain outside their jurisdiction, and eventually Archbishop Corboil induced the King to send them adrift and establish in their stead the Priory, a religious house under stricter monastic rule. From the days of Henry I, when the Canons quitted the place, until the days of Henry VIII, a period of 440 years elapsed, during which the precincts of St. Martin-le-Grand became a place of merchandise. No historian has stated exactly how this was brought about, but there is no doubt the Market Place owes its origin to St. Martin’s Pair. This annual gathering, established by Royal grant about the year 1160, was held in the Market Place, which was then St. Martin’s Churchyard. In the first instance, this fair was mainly of a religious character, in honour of the Patron Saint, but, subsequently, merry-making and trafficking became its chief features. Foundations of the choir and lofty masonry of the church of St. Martin le Grand together with a section of the Roman baths uncovered in 1881. To denote its religious origin, a cross seems to have been set up, round which the people congregated, and in later days that pillar became the Market Cross. That Market Cross fell into ruin or was destroyed during the time of the Wars of the Roses, and in the year 1479, the Corporation, with the consent of the Prior, decided that a new cross should be set up at “Cross Place,“ and that the common market should be kept there henceforth. That intention was not carried out, but when the Priory was dismantled in 1540, the Corporation, without any authorisation, entered into full possession of the Market Place area. 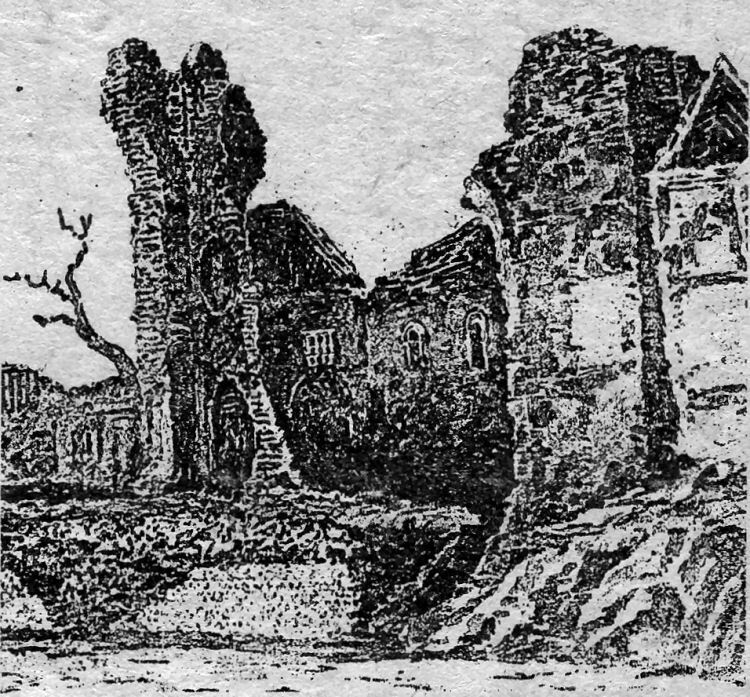 A sketch, reputed to be the church of St. Martin le Grand — but without a spire — from manuscripts of James Hammond, mayor of Dover in 1763, 1775 and 1783. The word “p’tended“ in this extract has been translated “pretended,“ but it is evident that the writer did not intend to convey the sinister meaning which we now attach to that word, it being obvious that “pre-intended“ was the sense desired to be conveyed. The previous intention of building a proper Market Cross which had been put in the minutes of the Corporation in 1479, and which had been allowed to sleep for 126 years, was now revived, and, on better consideration, developed into a Court Hall, which was promptly put in hand, and first used in May, 1607.